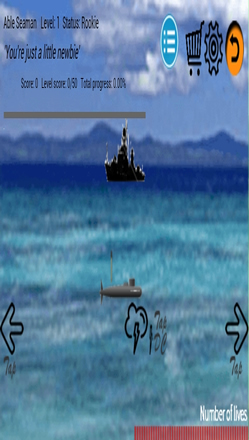 Here is the Battleship game a arcade game.Enemy submarines are all over blasting their limitless torpedoes at you. 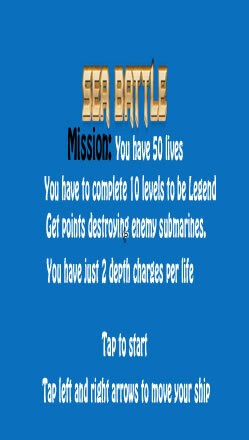 You have 10 levels to become from a Rookie to a Legend.You have 50 lives and just two depth charges each life. Your mission is to weave your way out of their reach. The ship moves on touch of left and right arrows. Depth charges blasted by ship on touch of the downward arrow. When you see a silhouette of a enemy submarine, you have to calculate and preempt the torpedoes and fire a depth charge so that it hits the target submarine. 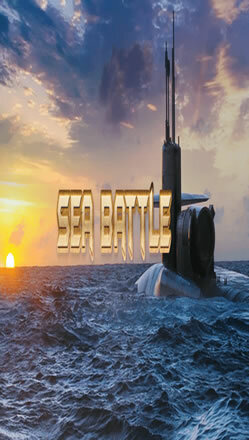 Hit submarines, earn points and go up 10 levels from Rookie to Sheep to Captain to The Blue Whale and be the Legend. 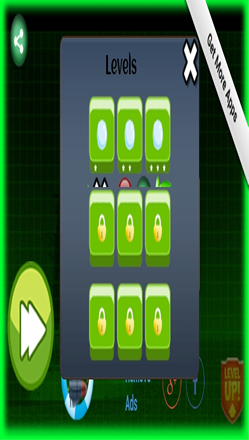 In app purchases to remove ads and also to cross the 3rd level. SIMPLE GAME, light, functional and interesting. No tilt movement, need use more than one finger to play! Get the app now! #8, 50th Street, 7th Avenue.